The countdown timer on Pebble’s homepage has finally run out, and so the mystery has been unveiled: the company has announced the Pebble Time, a $179 Kickstarter-funded smartwatch. This time around, there’s a color display. The screen uses e-paper technology – like a Kindle, but in color – which should mitigate the usual battery woes of color screens. Pebble is claiming a 7-day battery life, with the screen always on. There’s still no touchscreen, however. There’s also a microphone on board, which could you reply to messages more easily, as well as a gyroscope for motion sensing. Design-wise, the screen is now Gorilla Glass and features a steel bezel – a big improvement over the easily-scratched plastic display on the original model. The watch is also now 9.5mm thick (20 percent thinner than the original), and the back is curved to better fit your wrist. Customizing the watch’s design is also easier now, as all new Pebble bands will include a quick-release 22mm pin. The Pebble Time also features a “smart accessory port,” which allows developers to connect sensors and smart straps directly to the device. Details are currently sparse, but it could open up the way for missing features like a heart rate monitor or GPS. Of course, the company couldn’t simply add a color screen without implementing some new software. The watch’s new UI is centered around a timeline, which organizes notifications, news, reminders and events chronologically instead of in separate apps. This also works as the new app menu, which Pebble says will dynamically load and cache apps as needed, or you can simply pin them to your timeline if you prefer. The new OS is also backwards compatible, and still open source. 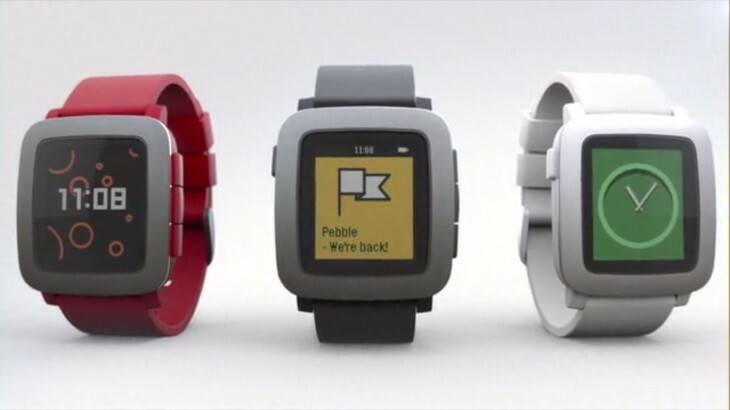 Like the original, Pebble Time is being funded by a Kickstarter campaign. It’s one of the fastest Kickstarter campaigns ever, reaching its total goal of $500,000 in just 17 minutes. It currently stands at over $3,000,000, an hour and a half after the campaign went live. When the original Pebble launched, it was pretty much the only player in the smartwatch game. The landscape is different now, with powers like Apple, Microsoft and a variety of Android manufacturers all touting their own offerings. Still, Pebble remains one of the most popular smartwatch makers out there, and the Time could benefit from an increased public interest in wearables. Its cross-platform functionality, purportedly long battery life and customizability could ontinue to set it apart, especially at its relatively affordable price point. Pebble expects the new watch to begin shipping in May. The earliest backers can buy it for $159, the rest for $179. It will retail for $199 once the campaign is over.